Bird Cage Covers - Cozzzy Cage Covers are the BEST! Bird Cage Portal is extremely pleased to offer COZZZY COVERS ... the best quality bird cage covers and the ones that copy-cat manufacturers try, but fail, to duplicate. 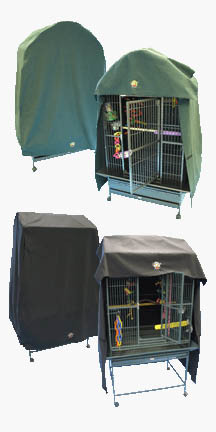 Cozzzy Covers provide the secure, warm and dark environment every bird needs for restful sleep. Offered in a variety of sizes they are made of light-weight, non-toxic poly-cotton breathable material and fit a wide range of bird cage sizes. These innovative easy-on, easy-off, easy-to-fold and store covers are very affordable and represent the best bird cover buy available today. Do your bird a tremendous service by covering their cage with a Cozzy Cover at night to insure 10 to 12 hours of quiet, restful sleep. You'll only spend a minute putting a Cozzzy Cover on even the largest cages. No more fumbling and frustration trying to drape a sheet or blanket over your cage. These covers feature a patented design which includes a flap that falls over the front of the cage serving several functions. Because the flap is secured on both sides with Velcro, it is easily lifted to allow cage door access without removing the cover! This design also makes the application and removal of Cozzzy Cage Covers so easy. They are machine washable, too! (Warm/cold wash and rinse, delicate dry is recommended). PLEASE NOTE: Cozzzy form-fitting covers specifically for the Avian Adventures, Kings, and California Cages and Custom covers are no longer being offered by Cozzzy Covers. Cozzzy Covers are proudly made in the U.S.A and are shipped free within the continental United States. They are available for shipping to Alaska, Hawaii and Internationally. Call for shipping quotes to these destinations.